There are a variety of ways to use Twitter. If you ask 100 online entrepreneurs how to use twitter to get traffic and leads you’ll probably come out with 317 different ways to do it (or more). That’s fine. So if you’d like to learn how to get traffic from twitter on that basis, you’ll like this micro coaching session. RELATED: Free Training Teaches You Core Skill Set Mastery for Internet Marketing and Social Media Marketing. Get more traffic, leads and sales online. Learn here. Twitter is universal. Everyone knows about it. It’s mainstream. Everyone’s got a smart phone. It’s massively popular among educated, well paid people under 50. If that demographic is one you’d like to generate business in, you should be learning how to use twitter to help grow your business. Bottom line? Twitter, used strategically, is a traffic faucet. So, here’s the super abreviated micro coaching session on a strategy you can use that is specifically designed to create targeted traffic from twitter to your content marketing pieces. STEP ONE: Your Twitter profile. You want people that come to your profile to “check you out” and get a sense of who you are and how you can help them, fast. You only have a few moments, so make them count. 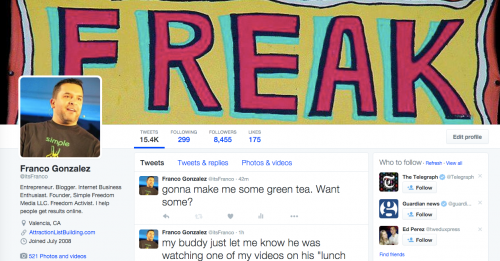 FOLLOW MY TWITTER: Click the picture below to follow me on my twitter. Profle Picture: MUST be your smile. Your face. Don’t mess this up with any other kind of picture. Cover Picture: Have fun here. You can rotate it. It could be a picture that tells the story of your personality a bit, your lifestyle, your mindset or, it can be a professionally designed branding piece too. Be creative. Just don’t be tasteless or lame. Your Bio: You have 3 seconds to have someone judge you positively, negatively or boring. NEVER be boring. Your Link: The ONLY reason we’re here on Twitter executing this traffic and lead generation strategy is so you can actually create traffic and turn that traffic into leads. Post the link to your blog or whatever primary site you use to collect leads into your marketing funnel. Lead Capture Page, Facebook Fan Page (22Social) etc. Getting traffic from Twitter is all about using targeted hashtags. You’re going to want to make a short list of the top 5 or so keywords (hashtags) that are relevant in your market. If you’r in the #weightloss niche, you’ll want to make note of the top 5 main keywords for that market, then go search the main ones on Twitter directly. Here’s a sample hashtag search for the hashtag #weightloss. By simply doing that alone, Twitter will give you a page full of tweets with great copy, content and “weightloss” related hashtags. Observe it all. Make note of the tweets that catch your attention. Also jot down any related hashtags you’ll see on thos posts such as: #nutrition, #paleodiet, #weightlossjourney, #healthyfood, #organicdetox etc. You’ll find tons of them. And you’ll find tons of great tweets. Jot them all down and save this material. You’ll use this as “raw material” to create your own content and then to create your own tweets about that content. Hashtags are EVERYTHING when you’re talking about using Twitter to create traffic. You want to create as massive a hashtag list as you can. Start with the main ones, the broad ones, and keep collecting hashtags until you’re saving some very specific niche hashtags. Growing your Twitter followers list is critical to this strategy. You never want to stop working to attract more followers and growing your audience. This way, everytime you tweet, more and more people see your content. So by using relevant hashtags on your tweets, you’ll get exposure to more new people, but your existing twitter following will keep seeing your tweets again and again too and that’s important. Your Twitter strategy is to use it like ESPN, CNN and Wall Street use their ticker symbol and news feed scrolling feeds. The more you become the source of valuable content and the more your growing followers list sees your tweets, the more traffic you’ll get from the strategy. Ok, so here’s some ideas on how to keep growing your Twitter followers list. Using your focused hastag list is very important to growing a high quality followers list of targeted people. Identify and follow key leaders, top producers, influencers and thought leaders in your niche. By following them and reviewing their tweets, you’ll find other people who are interested in similar content. You can then find others to follow and many of them will follow you back. BIG TIP FOR GETTING MORE FOLLOWERS: The best way to get noticed by people in your space and attract followers is to ENGAGE on their tweets by RETWEETING them and COMMENTING on their tweets. People notice you and many will choose to follow you. Be positive and supportive and don’t be a social networking jerk and you’ll do fine. I’ll warn you not to go too fast doing this. Twitter doesn’t like to see you clicking to follow bunches of people at once and you can get your account and tweeting privileges “timed out” so just be careful. You can read about Twitter’s follow policy here. This strategy is all about doing what Twitter loves people to do on their platform: DISTRIBUTE GREAT CONTENT. Make a list of all your past blog posts, youtube videos, facebook notes, podcasts and even some of your follow up email broadcasts. Anything that was “value focused” and evergreen so that its universal and could be shared anytime. If you don’t have much of your own content it’s ok.
Look around (search your hashtags) and you’ll find an endless stream of great content you can repurpose, edit, adjust and gather ideas to create your own. HINT: This post on my blog and many posts on it are “value focused” content pieces. You can learn by just clicking around and observing, then create your own with the help of these ideas. This works best if you have a blog but if you don’t, you can use your Facebook fan page. Make a list of all your “value content” links and save them on your desktop where they’re handy. Inside our private coaching program, Simple Freedom Academy, I give you a “cheat sheet” list of resources and places you can go to quickly have access to all the valuable content you’ll ever need in your business. Then we teach you exactly how to craft and distribute valuable content daily that attracts traffic and leads. 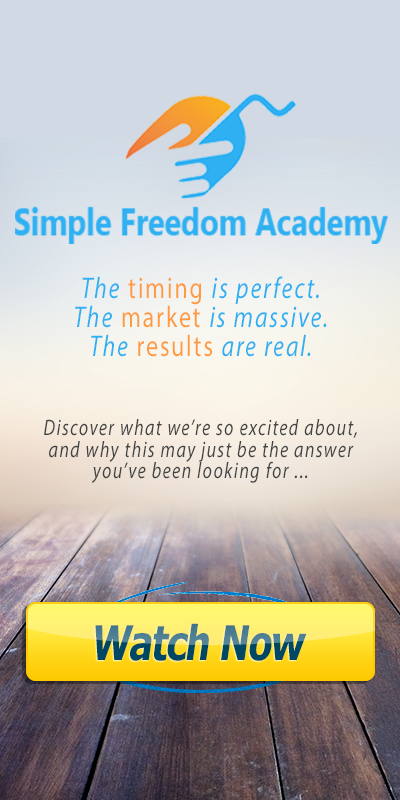 For more details on our Simple Freedom Academy coaching program click here. 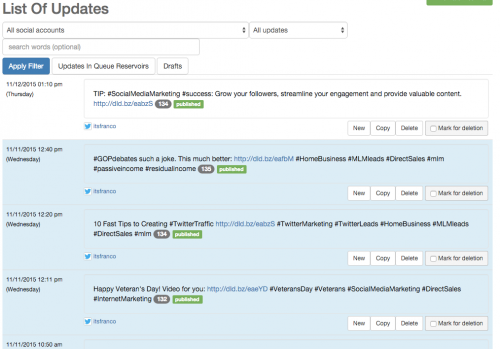 You’ll want to create MULTIPLE (3-5) different tweets inviting people to click to your “value content” links. This is how the strategy is creating “traffic” by attracting that targeted traffic from the hashtags you’re using, so they see your tweet, which invites them to click your link to consume your value content on your blog or fan page. See how that flow works? The hastag locates and attracts your targeted traffic. The tweet is your “headline” and compels them to click your link. The link directs them to your value content pieces. Your content pieces directs them to your offers and lead capture pages. That’s how you create traffic on Twitter. You’ll want to line up DOZENS of tweets. The more the better. Let’s say you have 10 solid value content pieces ready to go. You can create 5-10 different tweets that point to EACH of those links. That could create 50 – 100 different tweets all pointing people to your value content pieces. And if you keep doing that consistently, you’re creating a significant stream of targeted traffic. Follow my twitter here to see what that can look like. Twitter only gives you 140 characters to work with a long ugly links can devour that fast. SocialOomph – This is my favorite because it also automates my tweets (I’ll teach you that below). Goo.gl – This is another great, free link shortening tool too. There are others, but let’s keep it simple. These two are great for the job and I’d just get SocialOomph because I use it to automate the tweet posting job in this strategy and that’s a YUGE (in my Donald Trump voice) time saver. Before I teach you this part let just say I DO NOT believe in “autoposting” or automating the actual human engagement part of any social networking. Engaging: when you’re “liking,” “commenting,” “retweeting” and actually communicating, responding and carrying on conversations with people on social, I believe 100% that it should be real and authentic and not robotic or automatic. Having said that, there is a strategic way to automate those redundant tasks that are just mechanical so that you can create an automated system that cranks out targeted traffic to your content. Remember you’ve made a list of hashtags and content links and multiple tweets pointing to your links? 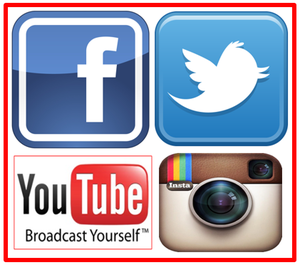 That’s what you want to lineup and automate by using SocialOomph. It’s easy and fast to schedule out your tweets. You can tweet out every 10 minutes if you like. All you do is open SocialOomph, copy and paste your tweets (with shortened links) into the form and choose a date and time for it to post and it’ll post your tweets all day and night. This is a completely redundant, mechanical function and doesn’t involve any human communication anyway, so it’s great to be able to automate it so you can then focus on other higher value activities like the actual engagement with people and follow up. So now you’ve created a smart way to consistently distribute valuable content on Twitter and create traffic with hashtags. How do you create leads with this strategy? Using our other coaching strategies regarding “List Building” you can use what I call the 80/20 rule to embed tweets into your system that are self promotional and designed to get people to your Lead Capture Pages so you can build your email list. 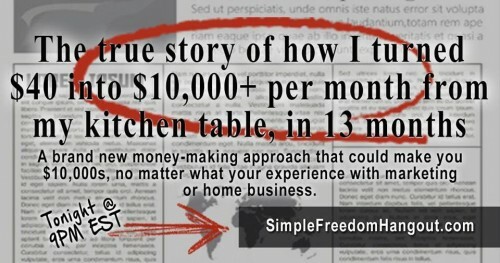 Now, if you’re using our Simple Freedom concepts and strategies, you already know buy now that your list building links and offers are embedded in almost all your content pieces anyway. So just getting people to your value content will be building your email list by itself. In addition to good content marketing principles, 20% of the time you can tweet out an offer for something valuable aimed at driving people directly to one of your lead capture pages. This kind of offer can be an invitation to one of your recorded or live training hangouts or webinars. Create the invite tweet and link to your lead capture page before sending them off to the hangout or webinar link. You can embed your “lead magnets” here as well. If you have an offer for a free ebook, or free video or some kind of value based lead generation offer, you can create those tweets and embed them in your Tweet Blitz using SocialOomph. 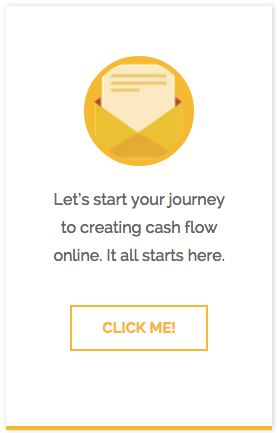 This is how you convert just traffic into actual email leads. Engagement is the “holy grail” of social networking. You’ll notice the people who truly have turned their social networking accounts on Twitter, Facebook, Youtube and Instagram into thriving businesses are those people with a gift for ENGAGEMENT. They’re in conversations LIKING, RETWEETING, REPLYING and just having a good ole time building real relationships. You want to learn to become a professional “ENGAGER” and good news merchant on social. It’s extremely magnetic and creates trust. 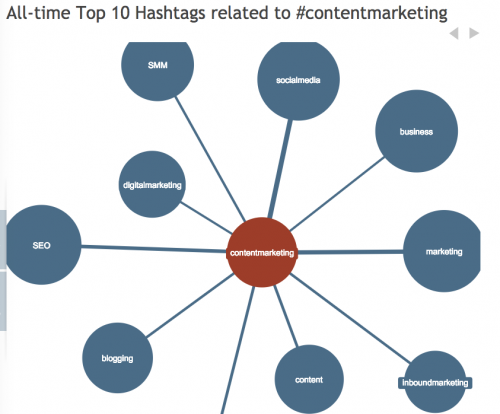 Use hashtags to find relevant content. Engage content by “liking,” “retweeting” and “replying” to content. Follow the people posting valuable content. If you’re consistent using the first parts of the posting strategy above, you’re going to start receiving messages, retweets, questions and comments on piles of your tweets. This is the great thing about automating the actual content distribution part. Now you can focus on replying to people, answering their questions, engaging others, asking questions, listening to your market’s wants and needs so you can come up with relevant content to share with them later. The beautiful thing about Twitter is that open engagement is a huge part of their culture. That means, the Twitter culture is open and accepting about people finding tweets and jumping into the conversation. The more conversations, retweets, replies and hearts you lay down on Twitter, the more exposure you continue to receive from the platform. Make a conserted effort to schedule in “ENGAGEMENT” time on Twitter and this strategy will work even better for you. Your main objective with this strategy is to create opportunities to engage and build relationships with new leads. As your Twitter Blitz traffic system works daily to create traffic and leads, your main goal is to follow up with your leads by follow up email, phone and social media. The most effective way to convert traffic to leads using this strategy is to have a smart lead creation system ready to collect leads and follow up email campaigns to leverage your follow up. Friend them up on Facebook. Listen to what they’re looking for and why. And just be a good person and look for ways to help them by linking them up with helpful information, links, people etc. Put their desires, wants and needs ahead of any personal agenda you might have and just SERVE your market. Trust me, if you just do that, you’ll never need any fancy “gooroo” closing tactics or “NLP” manipulation strategy. You’ll have more real leads you can possibly handle. HIGH CONVERTING OFFER: It’s critical to have an offer that is high converting and helps people generate cash flow while they learn the skill sets. Review a great one I use here. Your super hot rod, automated traffic creation factory on Twitter. You now have a strategy you can execute in as little as a day to start creating targeted traffic and collecting leads from Twitter. If you set aside even just 20-30 focused minutes to truly execute this strategy daily (even if it’s the middle of the night), it will start to create traffic and leads for you. The “secret sauce” to this strategy (and any other marketing tactic) is to make a decision to be consistent with it. That’s all. If you can just commit to doing it and not “judging it” or wavering for a solid 90 day run, it’ll blow you out your chair. Do it. Commit to a 90 Day Twitter Blitz. You’ll thank me for it later. I hope you enjoyed this micro coaching session and if you’d like to learn more about using the Internet and Social Media Networks to start and grow your own online business, you can start by getting my daily tips and free Simple Freedom eNewsletter here. Don’t be a stranger, either. Facebook or tweet me and let me know how your story unfolds. I’m here to help. You’ll find articles and special documentary films on the links below that will teach you what those reasons are. The bottom line is that I’m here to help you succeed asap. So, if you’re interested in dramatically decreasing the learning curve and getting into profit as quick as possible with minimal hassles, click below and let’s connect soon.